BY THE look of things the ruling party should win this year’s much awaited national elections -though it would be on a 'landslide'. Questionable unity? 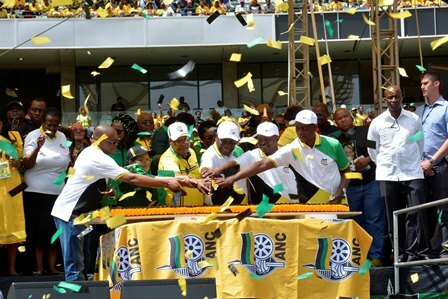 The ANC celebrated its 107th centenary last week in Durban. All of its leaders graced the occasion, including the former President Jacob Gedleyehlekiza Zuma (as seen in this picture). All hands on the deck. Image Sipho MALUKA. This narrative is supported by an overwhelming numbers that improved the GDP of eThekweni and KwaZulu-Natal, in last week’s ANC’s 107 Celebration and Manifesto launch, respectively. The iconic Moses Mabhida Stadium was packed to raptures by supporters and comrades from all corners of mzansi, resplendent in their party’s Green and Black regalia. Yes, struggles songs echoed throughout the day, to such an extend the ‘Gods of rain’ did not want to dampen the mood and the spirit of Comrades. The Indian Ocean opened its arms to forsake those with hidden agendas within the movement as they cleansed themselves. But, the question on the lips of many is, is the unity being perpetuated by the ANC a reality? Yes, former President Jacob Gedleyehlekiza Zuma and his backers did put up a brave face at the event- pre and post- owing to unfounded reports that the sitting Pres Cyril Matamela Ramaphosa would be booed during the delivery of his speech. KZN is Zuma’s stronghold and one of the biggest regions for the ruling party. But that did not happen, even behind the scenes at Gala dinner, walk-abouts and anywhere the supporters where at, no such took place as promised by host and chairman of the ANC-KwaZulu-Natal, and MEC for Economic Sihle Zikalalala, whom during a brief interaction indicated “look my Chief, all is under control and by the way we are here to celebrate the movements important milestone, nothing else. All our leaders are here, interacting with our members, structures and everyone, including those not members of the ANC. So no booeing or any mishap will take place pre and post the event,” said the unperturbed Zikalala, as he did his walk-about on the street next to the Durban City Hall, where a handful of hawkers were selling ANC regalia. However, it seems some of the contents of the manifesto created confusion on the nationalisation of the SARB that had Pres Ramaphosa and economists a full-day at office. According to reports ANC’s SG and former FS Premier Ace Magashule is calling for a referendum on nationalization of the bank that has set pigeons amongst the cats. 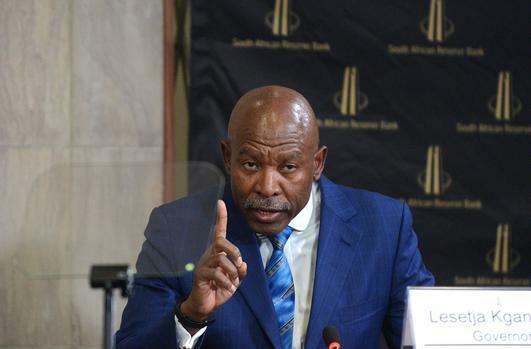 On Thursday at the Monetary Policy Committee (MPC) briefing in Pretoria, Governor Lesetja Kganyago minced no words when he reiterated “this issue was discussed last year with the Pres and as things stand would not want to engage with the media further on this matter. Pres Ramaphosa will advise accordingly. A rousing welcome. 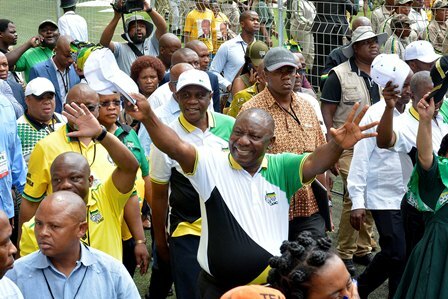 Pres Cyril Matamela Ramaphosa, Gwede Mantashe, Paul Mashatile, Sihle Zikalala and Dakota Legoete, welcomed by thousands at the 107 ANC celebration fete at Moses Mabhida Stadium last week Saturday. Image Sipho MALUKA. “But, let me state that should it happen that the bank be privatized, it means we will have to revisit the Constitution. Any government policy interfering with the South African Reserve Bank’s (SARB) constitutional mandate will not be implemented, “he said. Kganyago previously stated that nationalizing the bank could involve expensive legal processes. The Reserve Bank is one of six central banks in the world which still has private shareholders. “Since 1996, there have been several legislative changes to clarify the role of shareholders, reduce the influence of shareholders, limit the rights of foreign shareholders and reduce concentration through limiting the number of shares that related parties can hold,” he told the committee. The SARB’s board ensures good governance, but does not have a say in policy or regulatory decisions of the bank. Government appoints eight members of the board, which include four executives. The shareholders elect seven members. The Economic Freedom Fighters and its leader Julius Malema are also pushing for the nationalization of the bank. Economist Mike Schüssler said nationalizing the country’s central bank would not benefit the country, but instead increase state expenses, he was quoted. “It is not a good idea to nationalize the Reserve Bank. Government will have to spend more money to take out the private shareholders. Don’t touch me on my bank. Governor Lesetja Kganyago says the nationalization of Sarb will have to go through the Constitution. “The fact of the matter is that this is not going to change anything when it comes to policy because government appoints all the people who do policy work, and appoints all the members of the monetary policy committee,” said Schüssler. Finance Minister Tito Mboweni last year, also pleaded with detractors to stop attacking the independence of the bank. Mboweni was South Africa’s first black reserve bank governor. He served in the post for more than a decade between August 1999 and November 2009. Meanwhile, the MPC has decided the interest rate remains unchanged.